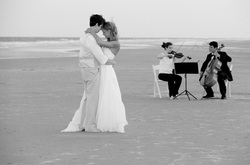 Specializing in personalized wedding music, Coastal Chamber Musicians has been sharing the joy of music in Charleston, SC, as well as Myrtle Beach, Savannah, and the surrounding area for over 10 years. Our passion is sharing our music with others and seeing the joy it brings into their lives. There is nothing like live music! Our mission is to help couples make their vision for their wedding a reality. That's why we work individually with you to find what works best for your needs. This includes customizing the instrument combination and music selections, adding special request songs for free, and working with the unique outline of your wedding ceremony. Austin Fitzhenry began studying cello at age six with former Charleston Symphony Orchestra principal cellist James Holland. Growing up in a musical family, he had the opportunity to begin performing at a very young age and played in his first wedding when only 11 years old. Eleven years of wedding performances later, Austin still gains a thrill from bringing the joy of music to listeners. In 2006 Austin earned a full scholarship for summer study at the Brevard Music Center. He has performed as a soloist with the Charleston Symphony Orchestra and served as principal cellist of the Charleston Symphony Youth Orchestra for 3 years. Austin continues to enjoy each and every opportunity he receives to make music. Leslie Fitzhenry has played the violin since she was six years old and has performed publicly from the beginning. In high school, she won first place in the Senior Strings division of the South Carolina Music Teacher’s National Association competition. After being chosen as a winner in a local concerto competition, Leslie performed as a soloist with the Charleston Symphony Orchestra. She now performs frequently for weddings and other events in the Lowcountry and surrounding areas. In addition to violin, Leslie also performs as a violist.